Since one year, Laurence Sabas is a Flaneurz ambassador. She is a quad skate coach following the Flaneurz concept development. She practices for 25 years. Flaneurz meet her and took part in her skate courses of Roller dance at the Aérosol. When she was 13 years old , Laurence discovered the Main Jaune. This place was a mythical night club for skate passionates during 90’s. It is close since 2001. It became famous since the movie “La Boum” with Sophie Marceau, because it was one of the movie setting. 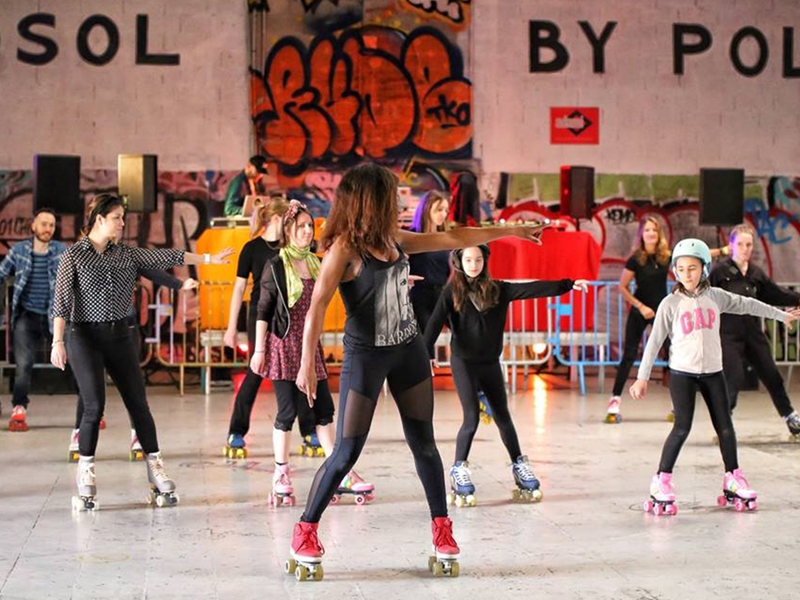 Laurence keeps hope and dreams about new Roller party at the Main Jaune: a call for projects. “How did you learn skating? At this time, skate coaching did not exist yet. I have learned alone and with friends. I met skaters who known interesting moves like Michel Raphanael and Stella Rennela. I have the sports instructor’s certificate and dance is my speciality. All sports instructors have to validate a common core and choose the discipline they want to specialize in. Did you begin inline skate or quad skate? At the beginning, quad was the only popular practice. Inline skate became famous. It was a success that multiplied the skaters number, because inline skating was considered easier than quad skating. When I was 20, my educational skills reputed by Adeline Lemen, Roller Squad Institut president, and I enjoyed teaching. When she asked me about becoming a skate coach, I decided to pass the certificate. Did your previous jobs were linked with skate universe? Besides my jobs (cinema, coffee), I practiced sports from the outset. I have always been invested in skating for the pleasure. I never took part into contest. How did you know Flaneurz? I met Florian Gravier, one of the co-founders via Jean Marc Gravier (who is not Florian’s brother! ), our SkateXpress roller dance crew responsible. What was your first Flaneurz pair? I integrated the ambassadors team during No Matter campaign and I should wear a range model. I had the Fila Cage Iceberg Green It was not the better pair corresponding to my practice, that is why I opt for a Change Your Shoes Custom. Change Your Shoes Custom concept is: After getting your first Flaneurz pair, be free to clip on several pairs of shoes on your rolling part! Does your Change Your Shoes better suits to your practice than Flaneurz Fila Cage Iceberg Green? Florian advised me the Nike Jordan, and I am delighted! And for the rolling part? Under Florian guidance, I opt for Premium model. It is the most adapted range for my skate courses, thanks to precision and maniabillity. In which situation do you use your Flaneurz? I use it every time. As I am a dancer, I am a boots adept. Now, with my Jordan, I feel more comfortable, and I don't want to put my old boots from the Risport italian brand. I use my Flaneurz to stroll in daily life and during my differents skate courses. I teach: collective, particular, or dance. I used it sometimes for performances or shows. How was your adaptation from boots to Flaneurz? Very well, I skate instinctively and I adapted to all kind of skate, regardless of wheels, shoes, or models. What is the Flaneurz system principal advantage? Simplicity and practicality: I took public transport, and I just need to clip out. Thus, I avoid contraventions, and when someone stop me to enter on wheels, I clip out, and I surprise everybody! It permits to promote the brand because Flaneurz system intrigues. How was your adaptation to the clip on and clip out system? As ambassadors, we were brand pioneer, testing first models. Now, the concept is more developed. It fonction really well, I just need few seconds to be equipped with my Flaneurz. How do you support beginners during your courses? How can we have skate courses with you? 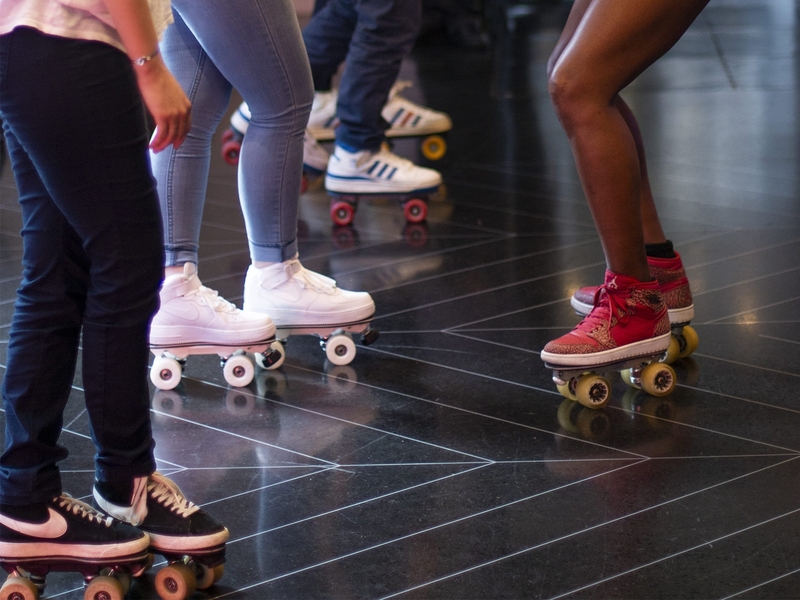 - Annual subscription with Roller Squad Institut: collective skate course of roller dance (29 sessions) including urban mobility courses: 310 euros. Start of the year in 2018-2019 is from the 20th of september. Courses will be on Thursday at 7:30pm in Paris 13th district. - Also, I organize some internship, the next will be : from the 7th to the 8th of July, with 10 courses hours and the inscriptions are via Roller Squad Institut. Do you use to participate into other types of animation ? Since I practice, I participate into various projects. I was sponsored by Salomon, Paco Rabane, and other brands. Then, I organize performances with the SkateXpress crew. We made show in the world and across countries. We worked in night club, we realized city animations. Now, the troupe is growing. We have participates to television show as “The Voice”, “Dance with the stars”, “Le Quotidien” or “TPMP”. We have a collaboration with Roller Brass Band which gathered musician in skates. How about your projects / future? Flaneurz was at the W Paris - Opéra for a pop-up store until Sunday 10th of June. Visitors were delighted to clip on and clip out new collection pairs, and to discover precedent collection. 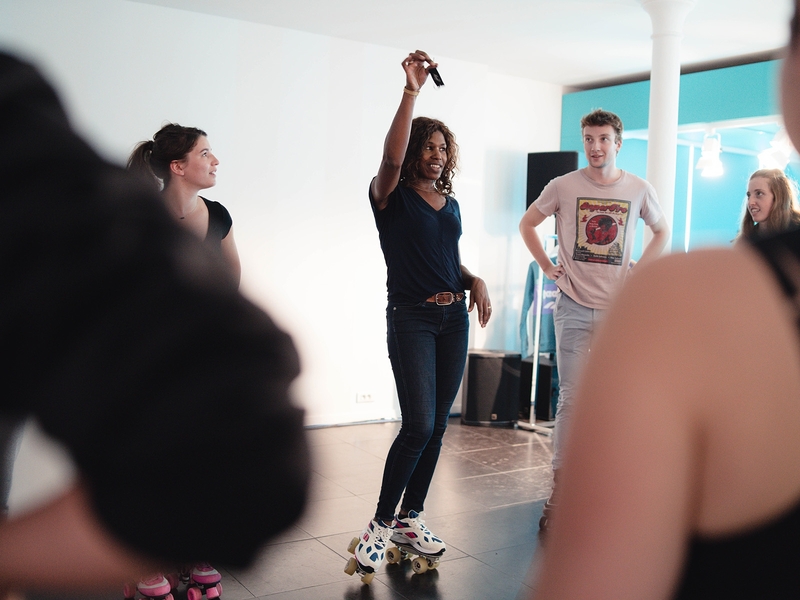 The event ended with a roller dance workshop animated by Laurence at the W Lounge. This is not the first time Laurence animates workshop with Flaneurz. Her communicative energy immerse all participants during the workshop. To be informed about Flaneurz summer events, subscribe to our newsletter.